A distant relative and fan of Sachiko. She arrives at Lillian during Yumi's second year. 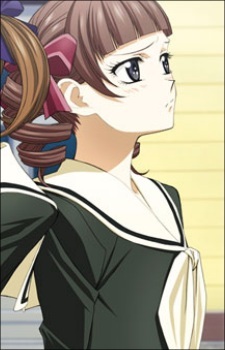 Touko is a member of the Drama club, and nicknamed Mechanical Drill by Satou Sei for her corkscrew pigtails. In the beginning of her first year Touko causes some strain in the relationship between Yumi and Sachiko. However, it is apparent later on in the year that she may become Yumi's petite soeur. Touko later wins the second card hunt when she half-accidentally makes Yumi uncover her card, thus winning the date with Yumi. She does so by basically asking Yumi to make her a petite soeur, and the recurring date practically ensures that Touko will become just that. In the same episode, we learn that Touko is also not the real daughter of the Matsudaira family, which made her the target for a lot of harsh words from the other close families. Despite this, her adopted family loves her like she was their own biological daughter, who adopted her after her parents died in a car crash, leaving her as the sole survivor. It's also revealed that Touko wants to take over the family hospital after her grandfather, but she wasn't allowed to do so yet, due to her young age. She will most likely be given that opportunity at a later date, though.